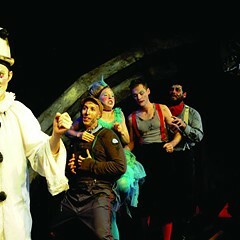 Beckett's existential clowns get cutesified in Halena Kays's incongruous staging of the absurdist classic. In Endgame, life is more than a "tale told by an idiot . . . signifying nothing," as Macbeth puts it when he's feeling blue. It's also a tale told to idiots—and no one is listening. The primary tale-teller in Samuel Beckett's 1957 absurdist classic—currently receiving an incongruously cutesy revival from the Hypocrites—is the blind, paralyzed, and imperious Hamm. He sits enthroned in a ratty armchair on casters, holding forth for an audience that includes his servant, Clov, with whom he's locked in an eternal vaudeville routine of codependent cruelty, and his legless parents, Nagg and Nell, who are kept in trash cans a la Oscar the Grouch. This shabby foursome is holed up in a sparsely furnished room somewhere—or more accurately, nowhere. When Hamm periodically orders Clov to describe the view from one of the room's two windows, the report is pretty much the same, whether he's looking out at the land or the sea: "zero . . . zero . . . and zero." The world outside has evidently been destroyed by some unnamed cataclysm, but it doesn't feel right to call Hamm and company survivors, especially not if the term implies acts of heroism. Let's just say they persist. In Halena Kays's staging for the Hypocrites, the characters are surrounded not by an infinite and indifferent blank, as in the script, but by what appears to be a child's birthday party. Amid walls painted sky blue, the audience is seated on risers adorned with artificial grass and given candy and conical party hats. Set designer Elizabeth Bracken puts Hamm's cell in a wagon with cabinetlike doors and a red curtain, suggesting a puppet theater. I couldn't tell you what Kays hoped to accomplish by having Beckett's existential clowns perform at a birthday party, unless it's meant to be a kind of memento mori—the fly on the cake reminding us that all fun and games come to the same end. Or maybe we're just supposed to appreciate the comic collision of the author's dark philosophy and the wholesome entertainments of childhood. Sort of like what you'd get if you took the Addams Family to Chuck E. Cheese's. In any case, the concept not only contradicts the text, but also shrinks and prettifies Hamm's predicament. Instead of inviting us to consider how Beckett's slapstick in the void relates to humanity's place in the cosmos, Kays gives us a darkly funny yet manageable shadowbox that's safely closed up and put away after the figures inside have finished their routine. Similarly, there's something too cozy about Jessica Kuehnau Wardell's old-timey costumes, and even the Irish brogues adopted by the cast. 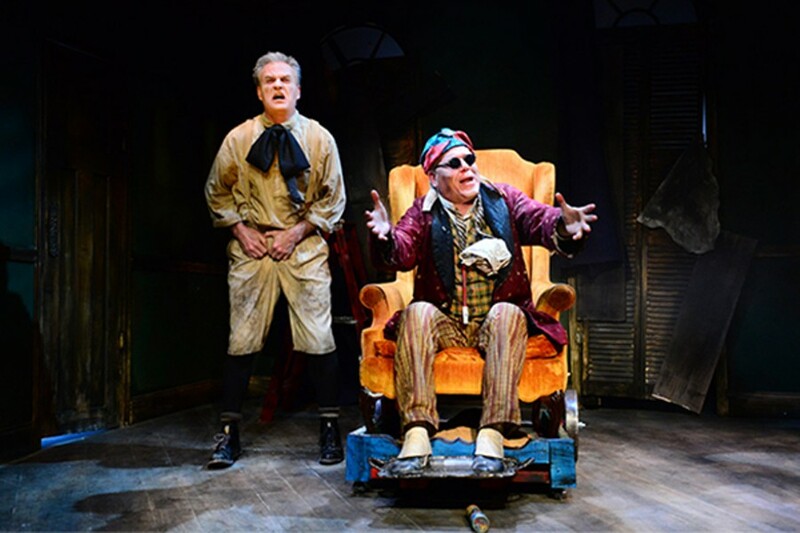 Both of these elements can be justified; the costumes evoke the silent comedians Beckett riffed on, and the accents are a nod to the author's country of origin. But when it starts to feel like we're peeking in on colorful eccentrics dwelling in a quaint cottage by the sea, we've drifted far from Beckett's bleak universe. One area where Kays's interpretation works with the script instead of against it is in its overt theatricality. In his fondness for asides and soliloquies, in the way he's always telling the other characters what to say and do, and in his concern with the effect he's making, Hamm resembles a domineering actor, director, playwright, and stage manager all rolled into one. Kays's play-within-a-party conceit helps draw our attention to this preoccupation with performance, which Beckett presents as a futile and laughable effort to invent meaning. "Me—to play," Hamm says at the beginning, but what he ends up enacting is Macbeth's idiotic tale signifying nothing. 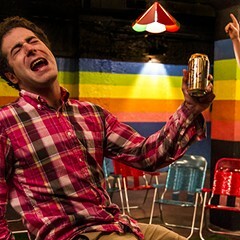 As Hamm, Kurt Ehrmann throws a pretty good tantrum, and he clearly relishes the license to, well, ham it up, but we don't get much of a feel for the torment he keeps saying he's living in. When Clov blithely denies him his daily painkiller, for instance, Ehrmann seems more peeved than anguished. Brian Shaw's stiff-legged Clov, meanwhile, is a standard-issue dunce whose vocal patterns (except for the Irish lilt) seem modeled on Art Carney from The Honeymooners. The strategy of playing the script strictly for laughs is preferable to the leaden solemnity Beckett sometimes inspires. Ehrmann and Shaw have the snappy comic timing to carry it off for long stretches of the play, particularly during Hamm and Clov's mordant exchanges ("Do you believe in the life to come?" "Mine was always that"). But the only moments when this production comes close to conveying the heartless absurdity of the universe are during the brief appearances of Sean Sinitski's doleful Nagg and Donna McGough's delicate Nell, who spend their wretched twilight days whining for biscuits and pining for the past, respectively. They get the least stage time, but they're the ones who stayed with me. 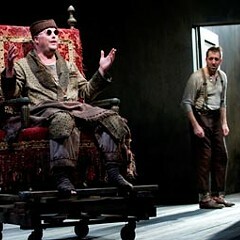 The Hypocrites' version, 12 Nights, offers antic energy but not a lot of depth. 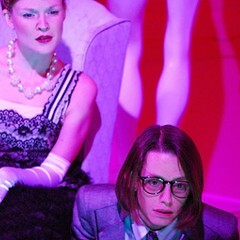 Sean Graney tweaks Sartre's existential comedy. Regular guy William Petersen hobbles Steppenwolf's otherwise excellent Endgame.